I love when I get a chance to try out a product that I never heard of before. 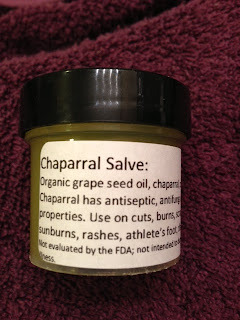 I was given the opportunity to try Chaparral Salve. This is a natural salve which is handmade. Chaparral has antibacterial, anti-fungal, antimicrobial, and antioxidant properties. It is used for a variety of skin ailments such as minor cuts, burns, scrapes, diaper rash, dandruff, athletes foot, rashes, hives, and dry skin. I had a few cuts which were bothering me so I put some salve on them. The product has a light scent and it absorbed quickly. I found that it definitely lessened the discomfort I was feeling. I also tried this on my extremely dry and cracked lips. The salve helped with the cracking and peeling of my lips. I tried it on my dry elbows and they softened considerably. I am a big fan of natural products and of multitasking products. This salve fits the bill. It has so many uses that it is worth every penny. I highly recommend this. 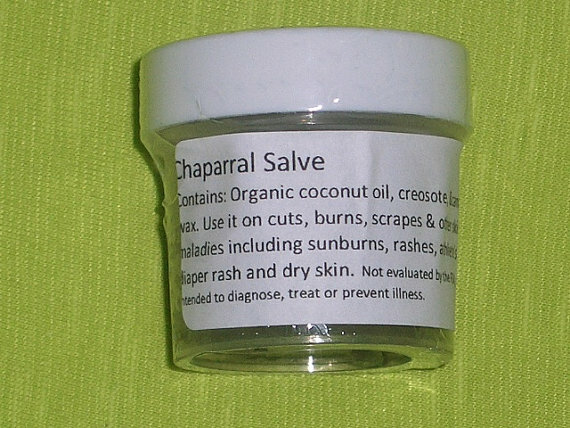 The great news is that I am giving away to one lucky reader their very own Chaparral Salve. a Rafflecopter giveaway The giveaway will conclude on at 12:00 a.m. est on Saturday 8/17/13. Winner will be announced via Rafflecopter and in a separate blog post which will be published on Sunday 8/18/13. Winners will also be notified via email & announced on the Rants and Raves with Yvonne Facebook page. Giveaway open to U.S. residents only. I love products that have multiple benefits, thanks for the review and giveaway! This would probably do wonders for hands; I don't know why, but my hands tend to be extra dry. I'm always on the look out for natural and eco-friendly products -- love that it's can be used for multi-purposes. Good information, thanks for sharing! Gotta checkout the website. Just entered your giveaway; thanks for the chance to win and try it.